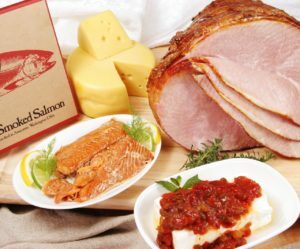 Smoked Turkey, Swiss, Salmon, & More | Order Online! We ship on Mondays & Tuesdays for Free FedEx Ground Shipping. Delivery on Thursday or Friday (See Days in Transit Map for actual delivery date). For a quicker delivery date you can choose Expedited Two Day Shipping or Next Day Air at an extra charge. Maximum 35 characters per line. Celebrate with the unforgettable combination of flavors in this gift package starting with our moist and delectable smoked turkey breast, smothered with our signature honey crunch glaze and conveniently sliced. 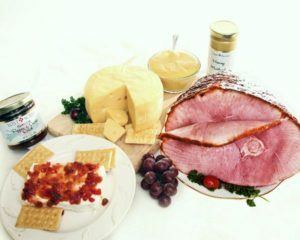 Enjoy the creamy gourmet taste of our Baby Swiss Cheese and the sweet and heat sensations of our popular Sweet ‘n Hot Relish. Slow roasted jalapeno peppers, red bell peppers and sweet onions combine to make a mouthwatering relish for our turkey or mix it with cream cheese for a unique dip. Finally add our Alaskan Sockeye Salmon appetizer, this handcrafted delicacy is carefully filleted by hand and made 100% bone-free. A special brine recipe and patient smoking over rich aromatic alder wood combine to create a taste that will not soon be forgotten. Please Do Not Heat your Turkey Breast. 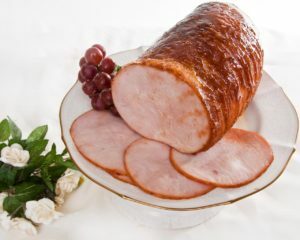 Our turkey breast is not water added or processed, they are moist and full of flavor. Heating will only dry it out. We suggest serving at room temperature. Set out half an hour before serving. You and those who receive your gift must be completely satisfied or we will make it right. Our family reputation depends upon your satisfaction.